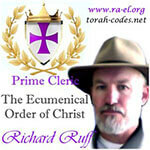 Richard Ruff is the Prime Cleric of the Ecumenical Order of Christ and former Australian Soldier. He served as a Peace Keeper in Peace Keeper missions and is military trained in Encoding and Decoding. Jewish Scholars have believed that the Torah was transcribed letter by letter as a code for the End Times. In the computer age, this became more possible with E.L.S. (Equidistant Letter Sequences). After his active career in the army, Richard Ruff began to study Torah Codes and started to look into it in order to debunk “false messiahs”. He discovered several Torah Codes for people who proclaimed to be the returned Christ, and could prove them wrong using by searching through the Torah. Richard initially set out to debunk this individual named Lord RayEl, and what resulted was hundreds of Torah Codes that only confirmed him as being genuine. That was enough for Richard Ruff to search different variations and terms, and the Torah repeatedly only confirmed Lord RayEl (Ra-El) as being who he said he is. After this proof by G-d, he became Prime Cleric and lead the Ecumenical Order of Christ and set out to reveal the truth and spread the word of the returned Christ. Richard Ruff has now found and published over 1,000 Torah Codes discoveries confirming Lord RayEl has the Messiah, Yeshua, Shiloah, King of Kings, Enlil, and much much more. Other prominent discoveries include natural disasters, like the Nepal Earthquake and the Frozen Chastisement, before they actually occurred. For years he worked tirelessly to bring the truth to the world and warn the people of what is to come in these End of Days. Richard Ruff has confirmed, through the Torah Code, exactly which Biblical figure he has reincarnated as… and the results are amazing. Check out our sister website page explaining this amazing knowledge below.